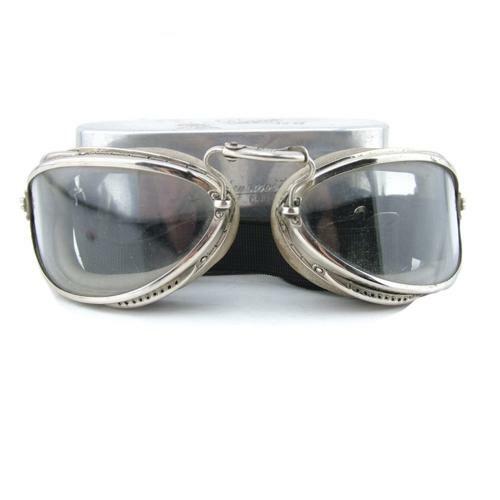 Luxor No.6 flying goggles manufactured in France by E. B. Meyrowitz of Paris. High quality nickel plated frames with central slide adjuster. Grey rubber cushions and curved clear glass lenses. Fitted with a simple black elasticated strap with adjuster clasp and 'hook' fastener. The goggles are in super condition with excellent frames and lenses. Even the cushions are excellent with only light soiling and no perishing or damage. The strap elastic remains strong and the metalwork is untarnished. Clear markings on the frames. These come with the original white metal case, again with clear markings. A beautiful set of goggles typical of the private purchase style favoured by many the U.S. Army Air Corps and RAF pilots during the interwar and early WW2 period. Good examples of Luxor's are hard to find and highly sought after. Stock code G20579.